Jo-Liz Prosser has been a registered nurse for almost 20 years, and is the Head of Nursing at TAFE Queensland East Coast and leads the accreditation process with The Australian Nursing and Midwifery Accreditation Council (ANMAC) for her TAFE region. At TAFE, Jo-Liz leads the design, development and delivery of the 18-month Diploma of Nursing and fosters effective partnerships with Universities, hospitals and health facilities. She and her highly skilled team consult closely with stakeholders to not only deliver bespoke hands-on clinical training, but also provide students with invaluable hospital placements and successful pathways to employment. 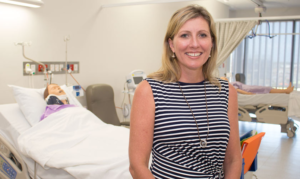 In 2017, Jo-Liz will lead the delivery of the Diploma of Nursing in the new Sunshine Coast Health Institute (SCHI) located in the Sunshine Coast Health Precinct. SCHI is one of the largest joint ventures of its kind on the Sunshine Coast – a partnership between Queensland Health, University of the Sunshine Coast (USC) and TAFE Queensland. “The unique collaboration of the SCHI will enable Diploma and Bachelor students to cohabitate in a purpose-built training facility and utilise shared resources; providing a greater practical experience in their clinical skills training, resulting in an increased skill level prior to hospital placements and employment,” Jo-Liz said. “SCHI has a 370-seat auditorium, a 150-seat lecture theatre, three clinical research laboratories, e-learning labs and simulation suites which contains state-of-the-art technology and comprises exact replicas of hospital rooms including operating suite, intensive care bedroom, birthing suite and emergency resuscitation bay. “Training and assessment will be filmed on-site with the potential to live stream online to students in Bundaberg, Maryborough, Hervey Bay, Gympie and throughout the Sunshine Coast. The recorded training and assessment will then be archived as a learning tool for students to review and reference whenever they need to,” she said. A career in nursing offers people a very diverse set of transferrable skills. Nurses are easily relatable, good communicators, professional and highly skilled. “Nursing is incredibly diverse and can literally take you anywhere you want to go,” Jo-Liz said. “You can choose to work in metropolitan and regional areas or you can choose to travel and work on oil rigs, on cruise ships or in schools all around the world. You can even become a humanitarian aid worker in areas of natural disaster or crisis to save lives, alleviate suffering and maintain human dignity. “But it’s like anything in life; you get as much out as you put in,” she said. Students who enrol in a Diploma of Nursing with Jo-Liz and her highly skilled TAFE team will gain the skills, knowledge and practical experience required to graduate job-ready. “The health industry is ever-changing. An enrolled nurse’s scope of practice is now around 85% of that of a registered nurse,” Jo-Liz said. “Consequently, TAFE offers a unique practical application of study in order to meet these evolving industry needs and ensure the success of our graduates. “For example, students will have the skills, knowledge and capability to start practical placement after only 10 weeks. They will enter their placements with the foundations of anatomy and physiology, know how to process and understand paperwork, and appreciate the importance of ‘activity of daily living skills’ like nutrition, mobility care and hygiene. To put this into perspective, students studying to become registered nurses at University don’t typically start practical placement until towards the end of their first year. “Enrolled nursing can often be the perfect practical pathway to become a registered nurse,” she said. Students who undertake the 18-month Diploma in Nursing at TAFE are required to complete a minimum of 400 hours of practical placement which guarantees their skills become second nature and they graduate job-ready. “There will always be a need for nurses,” Jo-Liz said. “People who are confident, capable and caring are highly sought after and a career in nursing offers the ultimate in job satisfaction,” she said.